An overbid is created if there is a lot of bidding activity. The overbid is returned to the tax buyer with interest if the lien pays off. It goes to the former owner in the event the property is lost to tax foreclosure. It is the most fair system because at least the owner gets an amount of money in most cases, if he loses a valuable property because of the lien. As you'll see now, tax lien auctions having one of the other formats leave the owner with nothing if the property is foreclosed. Plus, these formats are susceptible to sleazy behaviour amongst tax sale buyers and auctioneers. Instead of bidding up the price of the lien, buyers at these tax lien auctions bid down the interest they're willing to accept for their return. The starting interest rate for each lien is usually quite high, in the area of 15%-18%. However, on valuable properties this rate will be bid down quite low at the sale. Even to zero! Why would an investor invest at tax lien auctions that offered no interest? First, the liens often DO still pay a high interest rate for subsequent tax payments that the investor pays during the redemption period. So over time the investor can now invest a lot more money at 18%. The investor also knows there is a chance (albeit a tiny chance) to acquire a property through one of his liens at a ridiculously low price. Since the liens aren't bid up with these tax lien auctions, the most the investor can have invested is a few years of taxes. If the redemption period passes he stands to make a huge windfall. A $200,000 property may be acquired occasionally for only $10,000 in taxes paid! This system works out fine for owners who end up paying off their lien. In fact, if they pay their lien off in the first 6 months, they probably just got an interest-free loan from the investor! Plus these owners don't have to potentially pay tens of thousands in extra interest on a large overbid like the first group. Overbids don't exist with these tax lien auctions. However, running tax lien auctions this way STINKS for people who end up losing their property. There is not even an overbid to ease the pain, the owner is just 100% out of luck! If several investors are still interested in getting involved with a tax lien that's already been bid down to 0% interest, the auction usually changes to a "Lottery" format. Other states employ this lottery format from the very beginning. This is perhaps the poorest format in terms of fairness to all parties. In many counties with a lottery format, the auctioneer just randomly picks someone with their hand up and allows them to buy the lien. There are really no rules determining exactly who gets to buy the lien. Similar, but more fair "round robin" tax lien auctions are conducted in some areas. 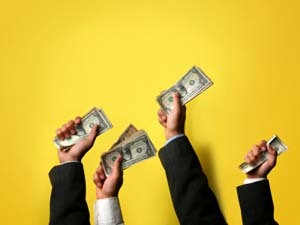 The right to bid passes from one investor to the next. When it's a particular investor's turn, he may buy the lien currently being offered or pass his turn and see what he's offered next time around. Tax lien auctions with this rather bizarre format require bidders to bid down the percentage of ownership in the property they would be willing to accept if the redemption period passes. The method probably made sense long ago when most properties were large tracts of land that really COULD be divided practically. But it makes absolutely no sense in an urban setting. Today, nobody wants to own a property with less than 100% interest because houses, for example, are not easily divisible. Therefore it's very rare that a buyer actually bids down the ownership. So, everyone bids 100%, and from there, secondary rules take place that allow for a lottery or some other process. This isn't really an auction format but it's worth mentioning. In some areas, large firms privately buy out every single tax lien in the county and so public sales aren't held. Individuals cannot buy liens in this case. Bidder collusion is always a possibility. Bidders may agree among themselves not to bid up the price of a lien, or not to bid down the interest rate against each other. Instead, they decide in advance "who gets what" and the others stay out of the bidding. In this illegal practice, all of the owners are stuck paying full 18% or more interest or having little or no overbid to fall back on. Luckily, many tax lien auctions are too large for these collusions to have any effect because there are too many others who are not "in on it", bidding away! Another complaint about "Lottery" tax lien auctions is that the auctioneer can pick his friends or associates when desirable liens come up, or award many more liens to one person than another. Because of these practices, some states are thinking about changing the format for their tax lien auctions. There are have been several recent cases of abuse recently, including allegations that an Illinois county treasurer awarded a large percentage of liens only to his large political contributors! So there you have it! Depending on your investment goals, and the amount of time you can tie up your money, you'll need to pick appropriate tax lien auctions. Google + me on the DeedGrabber.com home page or one of the many others throughout the site. As soon as you do, you'll get immediate download of my 50-State Tax Sale CheatSheets, free! You'll need a free Google account which takes just a second to set up, and then you'll have instant access to nationwide information on tax lien auctions and other auction types! If you need a Google account, just sign up here.